Everyone's favorite futuristic family travels back in time to team up with some of today's biggest WWE Superstars in! Following the success of Scooby-Doo! Wrestlemania Mystery, WWE Superstars Big Show, Alicia Fox, Roman Reigns, Seth Rollins and Sheamus team up with George, Elroy and the rest of the Jetsons gang in order to save Orbit City from the wrestle-bot army in an all-new original movie. The Jetsons & WWE: Robo-Wrestlemania, co-produced by WWE Studios, Warner Bros. Home Entertainment and Warner Bros. Animation, will be available on Tuesday, February 28, 2017 on Digital HD and on Tuesday, March 14, 2017, on DVD for $19.98/ $19.99 SRP, just in time for the excitement of this year's Wrestlemania 33. In the midst of an exhibition match, a powerful snow storm freezes Big Show solid. One hundred years later, Big Show has finally thawed and is discovered by George Jetson. His first mission is to revive wrestling in 22nd century Orbit City. With Big Show's help, Elroy and George build robotic Superstars. But Big Show had big plans of his own! The wrestle-bot army manages to capture Orbit City! This leaves George and the Jetsons family one option: travel back in time to enlist WWE Superstars Alicia Fox, Roman Reigns, Seth Rollins, and Sheamus to help defeat the Big Show and his wrestle-bot army in the future. With a star-studded voice cast, including WWE Superstars Big Show, Alicia Fox, Roman Reigns, Seth Rollins and Sheamus, this action-packed film is a can't miss! Bonus materials include exclusive content, behind-the-scenes segments and more! The Jetsons & WWE: Robo-Wrestlemania! will surely excite fans of The Jetsons and WWE alike! 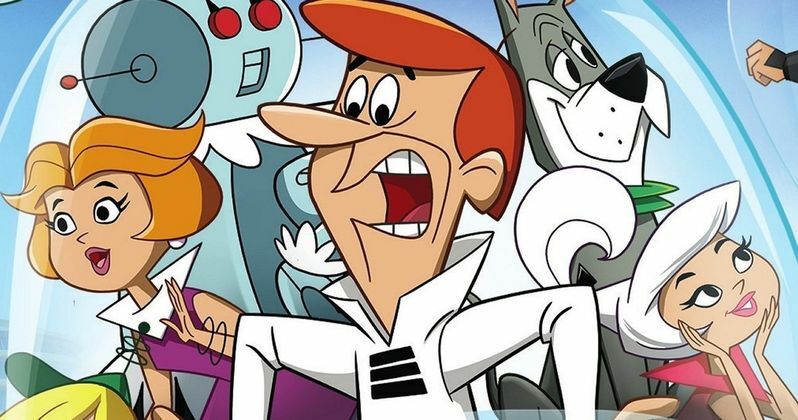 Related: Jetsons Animated Movie Is Happening at Warner Bros. In late 2014, Warner Bros. Home Entertainment (WBHE) and WWE announced a multi-year partnership for home video distribution of WWE programming that started on Jan. 1, 2015, and include United States distribution rights for physical and digital formats. The new agreement will provide WBHE the home entertainment distribution rights to release new documentaries, match compilations and pay-per-view events, including WrestleMania and SummerSlam, as well as a robust catalog of collectible titles throughout the U.S. The companies released Scooby-Doo! WrestleMania Mystery in 2014, and The Flintstones & WWE: Stone Age SmackDown! in 2015. A number of other WWE Superstars will be seen in another animated adventure, Sony Pictures Animation's Surf's Up 2: WaveMania, which will debut on DVD and Digital HD January 17. Directed by Henry Yu and produced by Michelle Wong, the follow-up to the 2007 Oscar nominee will hit the shores in time for the 10-year anniversary of the franchise. The voice cast includes WWE Superstars John Cena, The Undertaker, Triple H, Diva Paige and Mr. McMahon as an an infamous big wave riding crew of penguins known as The Hang 5 which Cody Maverick convinces to let him join on their journey to a mysterious surf spot where legend has it they'll find the biggest waves in the world. Take a look at the full trailer for The Jetsons & WWE: Robo-Wrestlemania below.